With growing collections, space is essential for museums, and Seattle’s museums are no exception. “We’ve been building at a pretty steady rate,” said Ted Huetter, the Museum of Flight’s public relations and promotions manager. At the Museum of Flight (9404 E. Marginal Way S.), housing for its large collection of airplanes is in constant need, he noted. Currently, a project is under construction that will roof 3.5 acres of land by next summer, keeping airplanes more protected from outdoor elements and allowing people to have a more interactive experience with them. 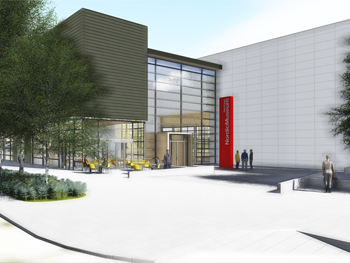 The new space, the Aviation Pavilion, will also include a new café and play area. It will be the museum’s largest renovation since 2012, when the Space Gallery was created to accommodate its Space Shuttle trainer. 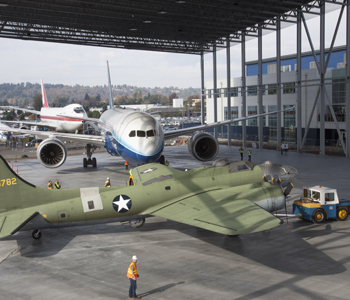 Boeing prototypes — beginning with a rare airplane from the 1930s, the only one of its kind in the world that still runs — will be on display. The museum’s collection of airplanes that are being restored are housed in its Evergreen Restoration Center at Paine Field in Everett. “It’s a good problem to have that your collection gets bigger and bigger,” Huetter said, adding that the downside is the need for funds to house such a large collection. The current building that houses The Burke Museum of Natural History and Culture (17th Avenue Northeast and Northeast 45th Street), Washington’s oldest museum, is not only too small for its collections connecting the past, present and future, its lack of climate control is also a danger to the items being stored there. Since the early 1990s, the museum has tried to solve its building issues, exploring remodeling and expanding the current facility, noted Julie K. Stein, the Burke Museum’s executive director. But as they worked on designs, staff members realized the best solution was to build a new facility that allows for decompression and growth. 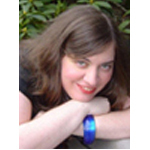 “Collections are key to teaching natural history and culture and obtaining a deeper understanding of the world around us,” notes the museum’s website (www.burkemuseum.org). “They are tools that can be harnessed to address challenges facing communities in the Pacific Northwest and around the globe. This will not be possible if they remain inaccessible in a building that compromises their longevity. “The Burke’s collections are severely compressed in spaces that lack the environmental controls needed to properly care for fragile, irreplaceable objects, putting hundreds, thousands, even millions of years of scientific data and history at risk,” the website continued. 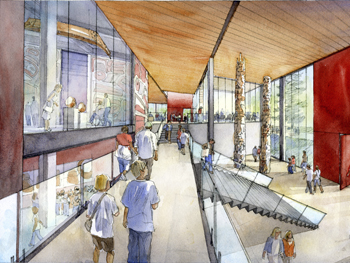 The new 110,000-square-foot museum facility on the University of Washington campus — 60 percent larger than the current facility — will break down traditional museum barriers, revealing the collections and research labs of a working museum and inviting visitors to be part of the daily discoveries generated at the Burke. “I am most looking forward to turning the museum ‘inside-out,’” Stein said. The budget for the New Burke project is $99 million, which includes design and construction of the new building, exhibits, moving costs, an operating endowment and landscaping for the new facility. The funding plan includes a combination of public and private support. The Burke plans to break ground in 2016. Construction of the new facility is expected to take 18 to 24 months, after which collections will move from the old building to the new building. The new facility is expected to open in fall 2019. The current museum will remain open during the interim. Ballard’s Nordic Heritage Museum (3014 N.W. 67th St.), located in the former Daniel Webster Elementary School, will also move to a new location. The museum has leased its present space from Seattle Public Schools for 35 years. Its new three-story, 53,000-square-foot home will overlook the waterfront at 2655 N.W. Market St. The Nordic Heritage Museum is considered to be the only U.S. museum with a collection, programming and exhibitions that focus on all Nordic countries: Norway, Sweden, Denmark, Finland and Iceland. Planning for the new facility began in 2003, with three parcels of land on Market Street the museum purchased between 2003 and 2009. The new $45 million building will allow the museum more room for exhibitions and to house its collection of more than 65,000 items. The building will also include better climate control and security, a 250-seat theater/auditorium, a cafe and a cultural resource center, with a research library where people can explore their genealogy. Funds raised to date have been provided by individuals, Nordic and local foundations, the State of Washington, King County and 4Culture’s Building for Culture initiative and the City of Seattle. The new museum will break ground in spring 2016, with a public fundraising campaign, and is anticipated to open in late 2017 or January 2018. The current location is expected to remain open during the transition for as long as possible, but museum staff members are planning for about a six-week closure prior to the opening of the new building. The Museum of History & Industry (MOHAI) also moved into a new home in recent years. In December 2012, due to the expansion of state Route 520, MOHAI was forced to move out of its 60-year home in the Montlake neighborhood. The museum relocated to its present space (860 Terry Ave. N.), in South Lake Union, a former Naval Reserve Armory in Lake Union Park that was designed in the late 1930s by local architect B. Marcus Priteca and served as an advanced Naval training school during World War II. The building is an official Seattle historic landmark and was added to the National Register of Historic Places in 2009. The Naval Reserve Armory was extensively renovated to provide 50,000 square feet of exhibit space. During the interim, collections went to the new MOHAI Resource Center, the site for the museum’s collections stewardship, conservation work and administrative functions. 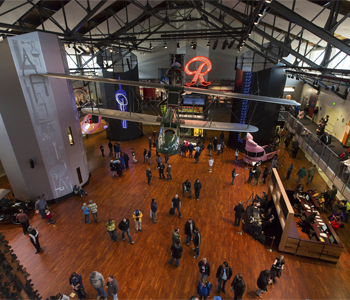 The reinvented MOHAI features a four-story atrium and a series of surrounding galleries. “Located in the South Lake Union neighborhood — next door to Amazon, the Bill and Melinda Gates Foundation and more — MOHAI is the place to discover why the Puget Sound has emerged as a global innovation hub, through interactive exhibits and award-winning public and youth education programs,” said Wendy Malloy, MOHAI’s public relations manager. The total project cost was $90 million, which funded the rehabilitation of the Naval Reserve Armory, creating new galleries and exhibits and increasing the museum’s endowment. The project also included relocating MOHAI’s staff, library and collection storage, which could not be housed in the Armory, into a separate conservation center. The new museum project was largely funded by donors, in addition to proceeds from the sale of real estate and mitigation from the loss of the Montlake property. The fundraising campaign and planning for the reimagined museum took several years. The renovation of the Amory, installation of the new exhibits and construction of the Resource Center took approximately three years.